It’s hard to say much when a small easy-reader children’s book is absolutely perfect from beginning to end. How often do we get to smile and laugh at an easy-reader book? Not often, in my experience. But this children’s book hits a theme that every child can relate to – the bedtime routine. Water, Story, Song, and … I won’t give the ending away. I wish I had known about this children’s book a few years ago when my grandson was about 5 or 6, as that is the perfect age for this easy reader. Perhaps even 7-years old, especially for an independent reader. But more than anything else, this little children’s book is a perfect read-aloud to put your little one’s to sleep, even if they are only 4. The illustrations are lovely. The repetition in the lines is perfect for an easy reader, as they help a child recognize the same words. The vocabulary is simple, and the sentences are short. I can’t quite call it a first chapter children’s book, as it’s too short for that. 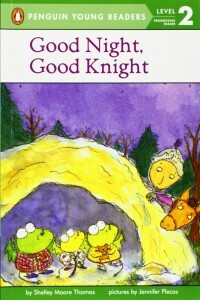 My final word – be sure to have this book on hand for bedtime reading.